Ekiti State Governor, Ayodele Fayose, has advised Aisha, President Muhammadu Buhari’s wife to drop the threat to sue him for defamation of character, saying by virtue of Section 308 of the constitution, he remained immune from legal attacks until the end of his tenure. 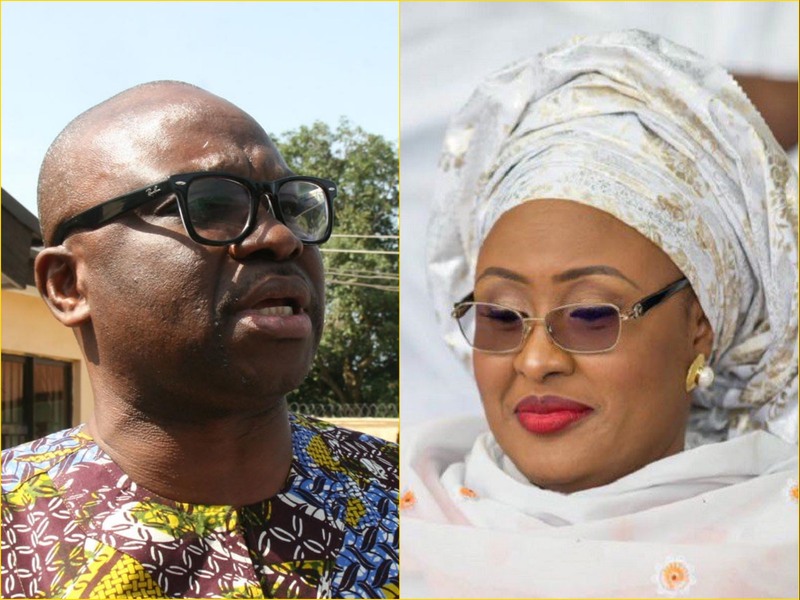 The counsel to the president’s wife, Mary Ekpere & Co had written a letter dated June 22, 2016, to Governor Fayose, demanding retraction of the governor’s statement that the President’s wife was involved in the Halliburton scandal, and threatening legal action if the retraction was not made within five days. However, in a response dated July 8, 2016, Governor Fayose said through his counsel, Mike Ozekhome, that he could only be sued after October, 16, 2018, when his governorship tenure expires. “Your attention is also hereby drawn to Section 308 of the Constitution of the Federal Republic of Nigeria, 1999, as altered, on the immunity enjoyed by our client from civil or criminal proceedings for the period that he occupies the office of the governor of Ekiti State,” the letter said. Meanwhile, no Aisha Buhari was named in the Halliburton bribery scandal and that Mr. Fayose was merely confusing the Williams Jefferson bribery case with the Halliburton bribery scandal. Former top officials of the Economic and Financial Crimes Commission familiar with the Williams Jefferson bribery case have also said the Aisha Buhari mentioned in the matter was different from the one referred to in the case. The letter reads; “Our client has referred to us your letter dated 22nd June, 2016, on alleged defamation of the character of your client, Her Excellency, Mrs Aisha Buhari, the wife of Muhammadu Buhari, GCFR, with firm instructions to reply to and reject same in its entirety. “Our client states and reaffirms categorically that the statement he made as regards the involvement of Mrs Aisha Buhari, the wife of President Buhari, in the Halliburton scandal, is correct and justified in law; having regards to a court judgement convicting one Mr William Jefferson for bribery in the Halliburton case. “The said Williams Jefferson is currently serving a jail term in the USA and to the best of our client’s knowledge; this judgment has not been challenged, or set aside by any Appellate court of law anywhere in the world. “The statement of His Excellency, our client, is therefore correct and justified, same having been factually premised on an existing court judgment above referred to. “Your attention is also hereby drawn to Section 308 of the Constitution of the Federal Republic of Nigeria, 1999, as altered, on the immunity enjoyed by our client from civil or criminal proceedings for the period that he occupies the office of the governor of Ekiti State.